These electrodes have a guard on the pH sensor, but the Redox sensor is unguarded. In some instances this is preferred, as it makes cleaning of the Platinum band easier. Rugged polymer bodies with dual pin-wick reference, they are supplied standard with 3 meter long low-noise coaxial cables and BNC connector. 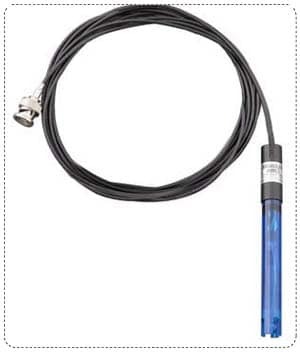 The pH and Redox electrodes have been designed for use in any pool or spa application. These sensors are designed for rugged service in submersion or on-line applications and are compatible with many pre-existing housings found in commercial and residential swimming pool controllers. All rely on pH electrodes and Redox electrodes to properly control the pH and Sanitizer levels in both swimming pools and Spas. We offer two different pairs of electrodes, what could be considered “economical” and “long-lasting”. Both will offer good value, fast response, and a quality construction.